Explore the world’s great literary works and find your own voice. Options are available to complete your degree 100% online – contact us today! In English, we love stories. That is a given. But no one gets a degree just for loving stories. Students of English learn about literary art in all its forms, grow knowledgeable about the development of literature throughout history, feed their curiosity about writers and texts that they have yet to discover, and master the ability to think and communicate critically and imaginatively. A degree in English will signal your proficiency in the discipline’s knowledge, methodologies, theories, and expressive skills. Literature across time: from the medieval literature of King Arthur to Shakespeare’s Renaissance stage to the Romantic poets and Victorian novelists to 20th-century Canadian and American developments and today’s newest works. 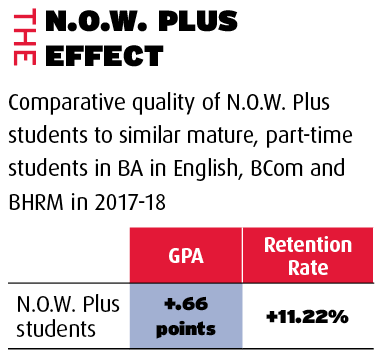 This is the same high-quality English degree offered by the Faculty of Liberal Arts and Professional Studies to other students, but with the added convenience and supports of N.O.W. Plus for working students. N.O.W. Plus is designed to help working adults earn a degree without disrupting their careers. You’ll have spots reserved in core Night, Online, and Weekend English courses, and you can take daytime courses if your schedule allows. To earn a Bachelor of Arts in English degree you’ll need to earn 90 credits. The specific courses you need to take will depend on which electives and optional courses you choose. Courses are typically worth three credits each. Please note: If you have not completed four full years of study in Canada in English at the secondary-school level or in a country where English is a primary language of instruction, you must demonstrate your language proficiency in English. Further exemptions are available. Proof of language proficiency can be provided by submitting an acceptable language test score.